NETWORK FINALS: More or less as expected, the NBA FINALS adjusted up to 7.3 in final numbers, while the reshuffling of west coast numbers sent the mini-JIMMY KIMMEL LIVE down to 1.2. Elsewhere, THE BIG BANG THEORY rerun gained 0.1, but AMERICAN GRIT lost the same. CABLE HIGHLIGHTS: Even with the NBA competition, USA’s WWE telecast topped Thursday cable, up 0.08 to 0.67. Spike’s LIP SYNC BATTLE climbed 0.08 to 0.42. The breakdown of the final night of ROOTS was as follows: on History, down 0.09 to 0.42; on Lifetime, up 0.04 to 0.33; on A&E, down 0.05 to 0.29; and on LMN, down 0.03 to 0.11. Bravo’s MILLION DOLLAR LISTING held at 0.40, and a lead-out preview of the new season of ODD MOM OUT was at 0.16. On We, BRAXTON FAMILY VALUES jumped 0.14 to 0.40, and MATCH MADE IN HEAVEN gained 0.03 to 0.20. The season finale of FX’s ARCHER was steady at 0.38. RIDICULOUSNESS returned to MTV at 0.38/0.34. 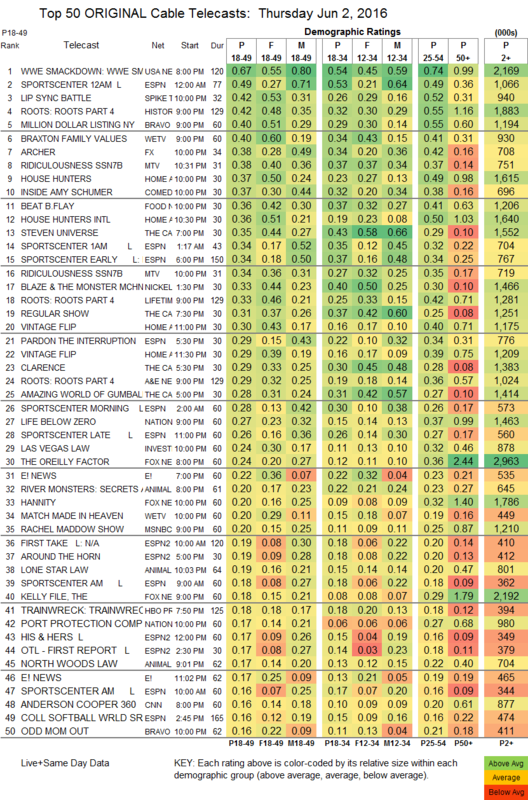 On HGTV, HOUSE HUNTERS ticked down to 0.37, and HOUSE HUNTERS INTL was at 0.36, with VINTAGE FLIP at 0.30/0.29. Comedy Central’s INSIDE AMY SCHUMER rose 0.08 to 0.37. Food Network’s BEAT BOBBY FLAY was up 0.02 to 0.36. TLC’s FAT CHANCE was at 0.15. Tru’s COMEDY KNOCKOUT edged up 0.02 to 0.14. 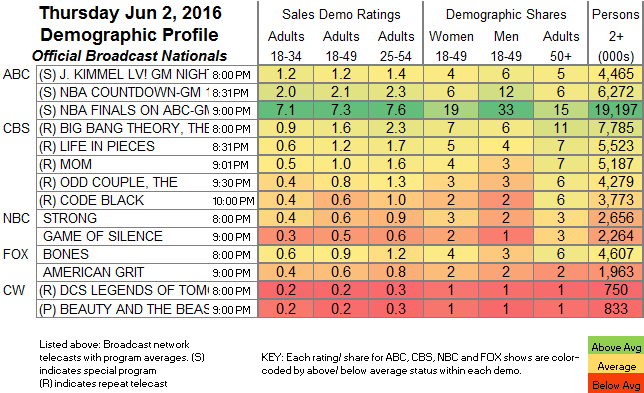 BBCAmerica’s ORPHAN BLACK was steady at 0.10, and AFTER THE BLACK lost a tick to 0.04/112K. Showtime’s SUBMISSION fell 0.02 to 0.01/98K.